July | 2012 | Cook It Quick! Fresh-from-the-field sweet corn purchased at Old Cheney Road Farmers Market, Lincoln, Nebraska. Sweet corn time is one of my favorite times of the year. Just shuck, boil, and eat for one of the tastiest foods on the planet. Some people who grow sweet corn start the water boiling before they pick the corn to capture the best of its sweet flavor! While we don’t have sweet corn growing in our back yard, buying it from our local farmers market is the next best thing. 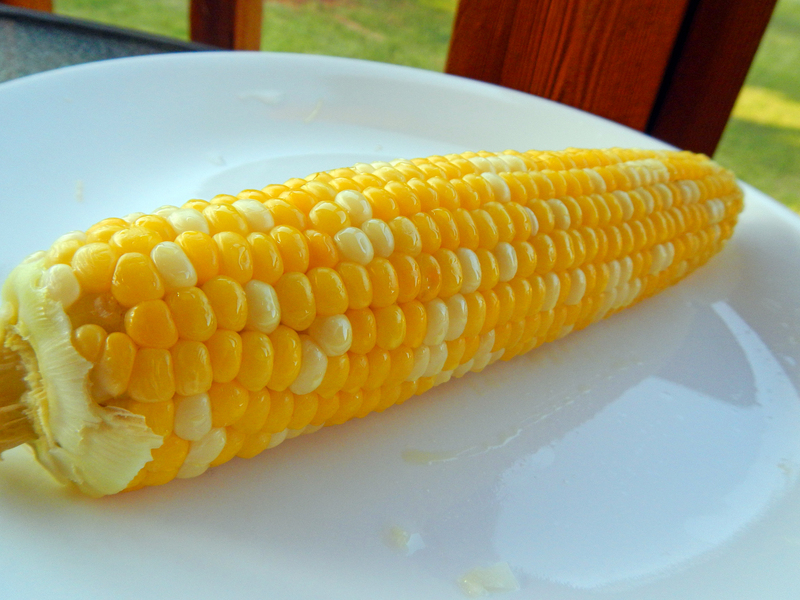 If you can’t eat sweet corn immediately when you get home, store it in the refrigerator and eat it as soon as possible, preferably that day. If you wait too long, its sugar turns to starch and that special sweetness is gone. 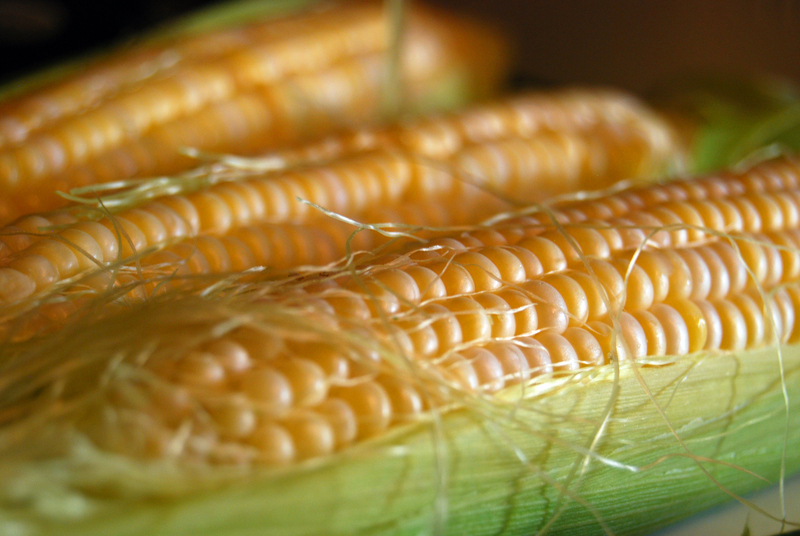 If you must store sweet corn … refrigerate it, still in the husk, in a perforated plastic bag. To make your own perforated bag, just punch holes into a plastic bag with a sharp object … for example, use a small paring knife to carefully poke holes (about 20 holes per medium-size bag). I boil my corn in a pasta pot and use my strainer insert for easy removal. A long-handled tongs also works well. Start a large pot of unsalted water boiling while you remove the husks and silk. Use enough water to cover the corn. 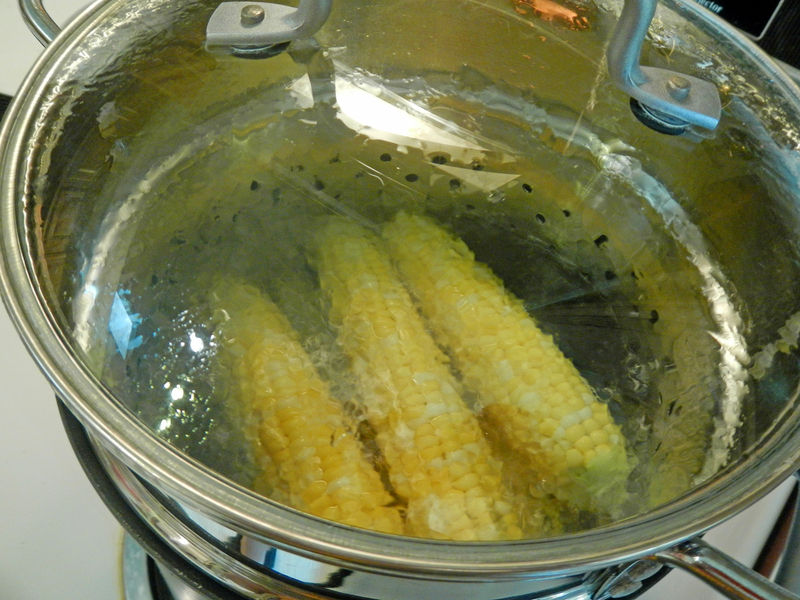 Place the corn in the boiling water, cover, and return to a boil. Reduce the heat to medium and cook for 3 – 5 minutes or until tender. 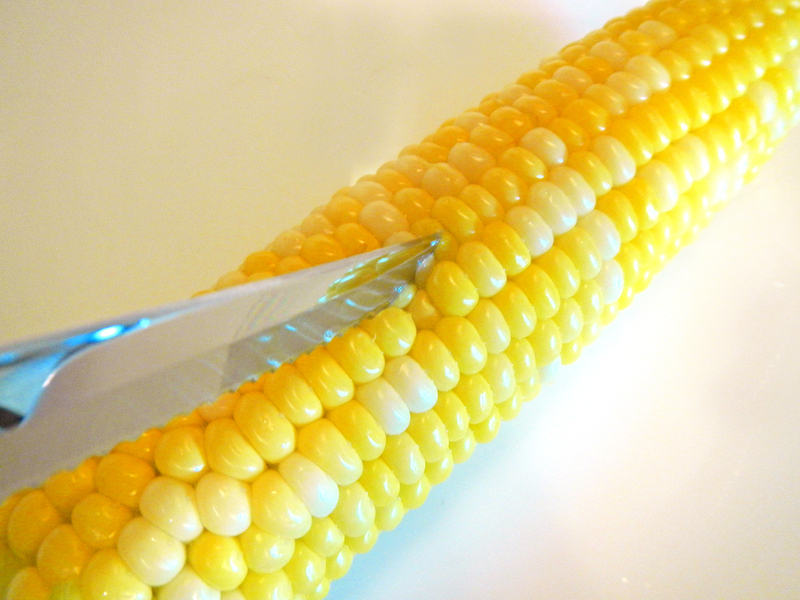 Testing corn tenderness by removing an ear and and poking it with a sharp knife. Dinner on the deck along with something from the grill and a side salad was never sweeter … or simpler! My husband and I enjoy brushing our sweet corn with a little olive oil. Perfect! Cool off with Tabbouleh, made with cucumbers, mint, parsley, tomatoes, onions, lemon juice, olive oil and whole wheat bulgur. 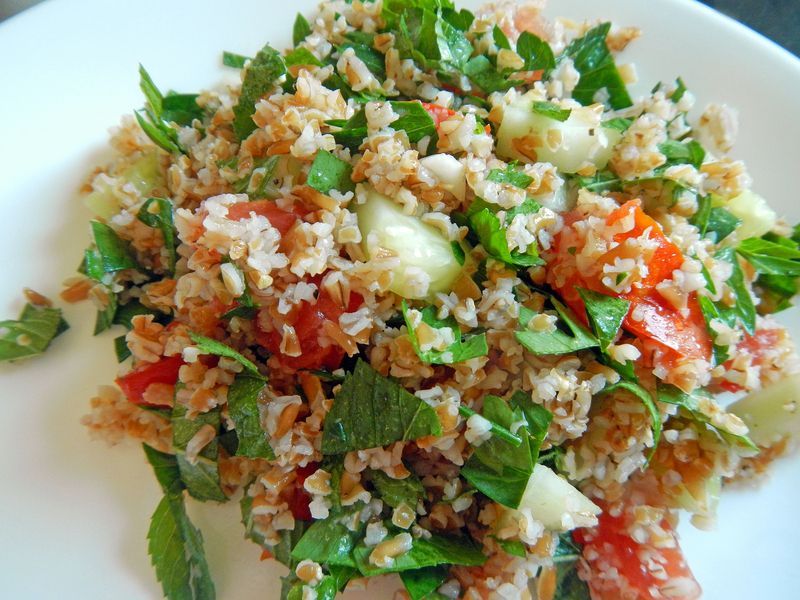 Tabbouleh stores well and tastes as good or better the second day. Exact amounts of ingredients aren’t necessary … so don’t worry if you have slightly too much parsley, not enough cucumbers, an extra tablespoon or so of lemon juice and so on. If you’ve never eaten bulgur, a form of dried cooked wheat made from whole wheat kernels that have been cracked into small pieces, tabbouleh is a delicious way to start. Bulgur is easy to prepare and can be refrigerated or frozen for later use. For more bulgur recipes, visit the Wheat Foods Council website at wheatfoods.org. Prepare bulgur according to package directions for starting with one cup of uncooked bulgur and the recommended amount of water for reconstituting this dry volume. The directions will tell you how long to let the bulgur set to absorb the water and become softer. After the bulgur is ready, mix together bulgur, cucumber, tomato, parsley, mint, onions, and garlic. In a separate bowl, whisk together olive oil and lemon juice. Combine with the other ingredients, mixing well. Refrigerate and let chill for 2 hours before serving for the flavors to meld. Season with salt and pepper, to taste, before serving. Before chopping parsley and mint, wash in a colander held under running water. Spin dry in a salad spinner or roll in paper towels to dry. Get more juice from the lemon by rolling it gently on a flat surface to loosen the membranes.